Article | Measuring visual exposure to smoking behaviours: A viewshed analysis of smoking at outdoor bars and cafes across a capital city’s downtown area. Smoking in downtown Wellington is highly visible outside bars and cafes, and could be giving the perception that lighting up is socially acceptable. New research from the ASPIRE2025 team at the University of Otago, Wellington, using a geographic tool usually used for landscape ecology and archeology, has for the first time anywhere mapped the visibility of smoking in city streets. Smoking was observed for different times and days of the week at 14 outdoor areas of bars and cafes, with data extrapolated to other bars and cafes with outdoor seating on pavement leases. 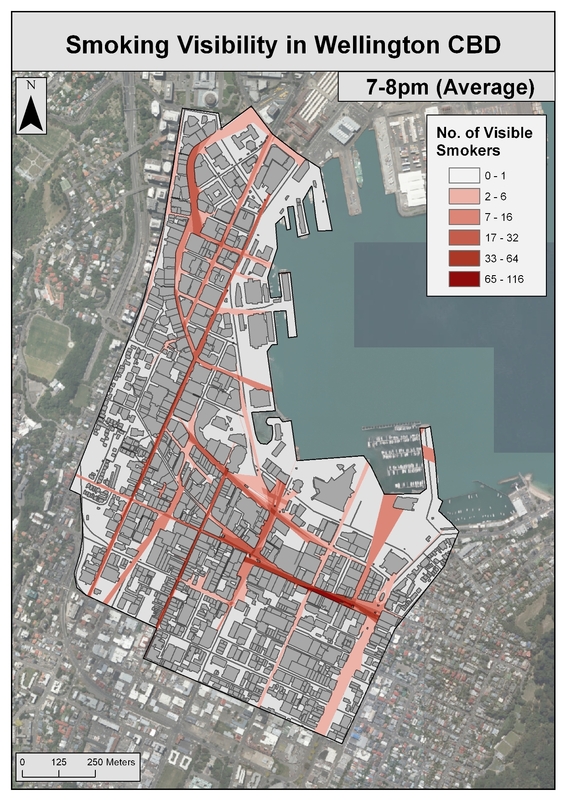 The results include a map of the Wellington CBD illustrating estimated visible smoking when it is at its highest, between 7pm and 8pm. The research found that up to 116 smokers outside bars and cafes could be seen from any one location in the outdoor public areas of downtown Wellington. Of 2600 people observed in the outdoor areas of bars and cafés, 16% were smoking, with a higher proportion than this in evenings. Lead researcher Dr Amber Pearson says that the methods developed through the research will help policymakers demonstrate the visibility of smoking in different areas, and will provide scientific evidence for local authorities to advance smokefree outdoor policies. Associate Professor George Thomson says the results showed the need for policies to reduce the normality of smoking. “Smokefree outdoor areas help smokers to quit, help those who have quit to stick with it, and reduce the normalisation of smoking for children and youth,” Thomson says. In Australia, North America and other places, local authorities are increasingly creating smokefree streets and promoting smokefree al fresco dining and drinking, Thomson says. The study has been published in the international journal BMC Public Health and was funded by the Cancer Society of New Zealand (Wellington Branch). There has been much media interest in this study both in NZ and internationally including a blog in the Washington Post which can be read here.